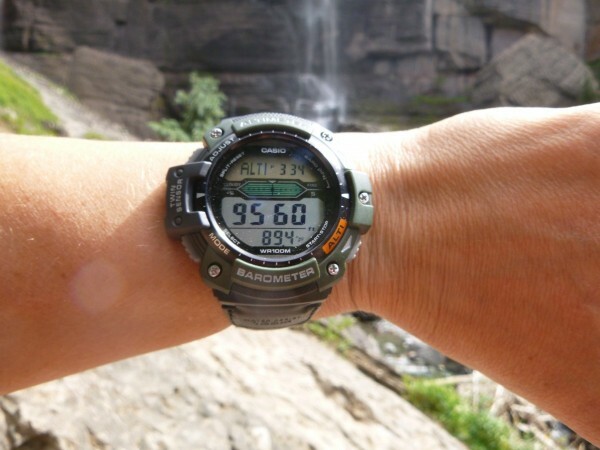 With this sports watch, you get a rugged construction that will keep up with your various sports and outdoor activities, multiple digital displays as well as key information regarding the altitude of your location, temperature, and atmospheric pressure. The comfortable design and quality materials used render it ideal for swimming, snorkeling, trekking, and other similar activities. Many customers have appreciated the product for being comfortable and durable and for providing accurate altitude information. However, we have found a complaint from a customer who tried it and noticed water getting into it with minimal water exposure. This was an isolated case, though. What customers usually expect and want from a sports watch is durability and this product was designed with this feature in mind. The rugged construction promises to ensure extended use and keep up with various sports and outdoor activities. It also features a woven nylon band with buckle closure and exposed screws on bezel. Moreover, the watch boasts a 50 mm resin case with protective mineral dial window and is water-resistant to 330 feet. Given these specs, you can use the watch even for swimming and snorkeling. It is not recommended to be used for scuba diving, though. Besides providing the user with enough durability to suit extended use, the watch is also comfortable to wear for long periods of time thanks to the green nylon band it features. Due to the buckle clasp, it remains secure. 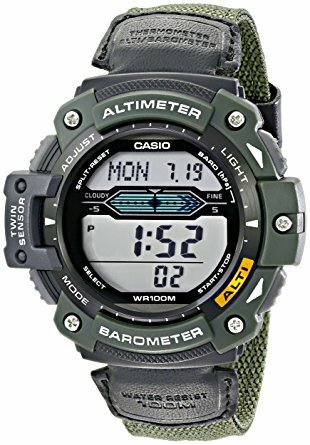 Since it is not just the regular, simple watch you can use to keep track of time, this model will also deliver information regarding the altitude of your current location, temperature, and atmospheric pressure. By providing you with such data, you will know if you’re on the right track and whether to continue or stop your trek or the activity you are engaged in. Furthermore, by letting you know about the altitude of your location, the watch will also help you reach the destination you have in mind by giving you an idea of your direction as well since you can compare your altitude and location to the maps you use. Such features render the watch ideal for navigating in the backcountry, exploring new places, fishing, hunting, backpacking, or other similar activities. In order to get accurate temperature information, it is best to take it off your hand and wait for it to cool or sense the real outside temperature. The sports watch is equipped with other features that will make the time you spend out there safer and even more enjoyable. You get 5 different alarms, a LED light to help you use it in low-light conditions, countdown timer, 1/100-second stopwatch, and 12/24-hour formats. All these features were developed so you can boost your outdoor experience and get the best out of it. Although it is not a solar-powered model, the battery it comes with is said to last multiple years and various customers confirm it. Therefore, add long battery life to all the features mentioned above.